In order to brace for the fourth industrial revolution, tech enterprises have not only been focused on developing a single “mindblowing” product, but they also began to attach special importance to creativity; using it for expansion of their technological ecosystem with the ultimate goal of raising and solidifying their market presence. In 2016, Tim Cook has stated in the Apple’s Second Quarter Results Report: “We are very happy with the continued strong growth in revenue from Services, thanks to the incredible strength of the Apple ecosystem and our growing base of over 1 billion active devices”. Over the past years, growing a strong ecosystem has increasingly been targeted by many firms’ as one of their priorities, regardless of the industry they belong in. Developing a robust ecosystem within industries focused on the use of blockchain technology is therefore not much of a diversion from the direction all other businesses are taking. Being well aware of this situation, we at Midas are focused on creating a range of products to develop our own unique ecosystem. 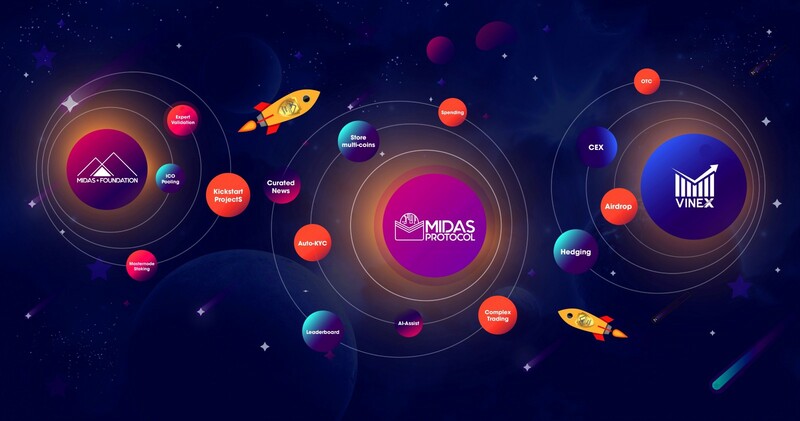 The Midas ecosystem’s concept lies in utilizing a collection of tools and platforms with a single aim to help people trade, invest and promote wise and secure use of cryptocurrency. So, if you are still a newbie in this space the Midas ecosystem might be the right place for you! Why? Simply because it is built to completely minimize the complications which may occur in all sorts crypto trading when still lacking knowledge and experience. And for veterans of the crypto space, the ecosystem brings about incredible convenience — a value only undervalued by those who have not experienced it yet. The very lack of ability to be able to purchase BTC, ETH or other cryptocurrencies, despite having the money is an incredibly common and a frequently occurring problem. It is astounding that this issue is not merely limited to the newcomers, but also affects those who have already dipped their toe into the crypto waters for a while. The issue is also further exacerbated by the fact that some traders live in countries where their governments have yet to legalise or even consider the use of cryptocurrency. Responding to such issues, VINEX OTC was developed to facilitate you and any other traders access to simple cryptocurrency purchasing. But what is OTC exactly? OTC (over the counter) is a decentralized market, without a central physical location, where the market participants trade with one another through various communication modes (phone, email or even proprietary electronic trading systems). 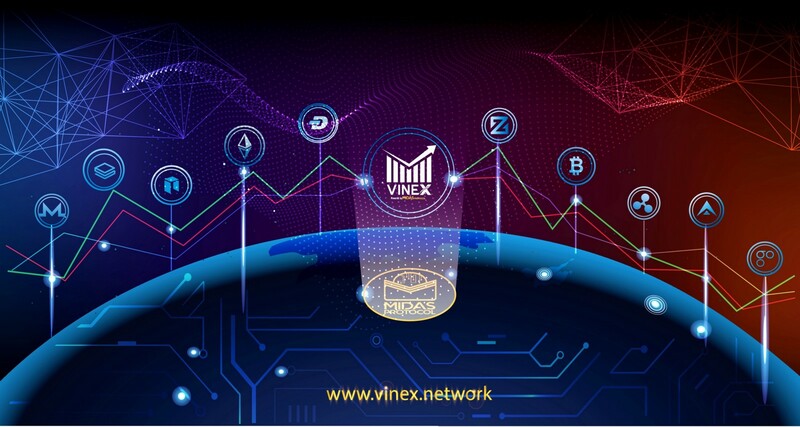 Putting this in our context of Vinex OTC, you can use Vinex as a platform where you are able to buy or sell the coins/ tokens of your choice in the simplest and safest possible manner. So now, when the issue of obtaining cryptocurrency has been annihilated and you are getting pretty good at trading, the question arises: where can you store your precious, hard earned crypto? Addressing this concern, we have developed our Midas wallet. You might be thinking that there are numerous of crypto wallets within the market already, as if we need another one… However, with the Midas wallet gone are the times where you would have to double transfer your cryptocurrencies in order to be able to trade with them/ use them on various platforms. The Midas wallet is one of the few multi-cryptocurrency wallets that users can use to store multiple cryptocurrencies, tokens and coins and at the same time directly trade with them on the exchange. Just as simple as handing money to the cashier to pay for your groceries. When having safely put your crypto into the wallet, you will want to utilise them in various ways: trading, investing in ICO or simply use them as a means to pay for your products online. Within the various activities which the trader engages himself in, or even in the simple process of exchanging a specific cryptocurrency for another one, the Midas wallet conducts complex trading activities directly from the wallet within multiple DEXs and CEXs. Most of the centralized exchanges only support few order types such as: limit order & stop-limit order. Decentralized exchanges are even more dreadful and merely offer the option of order limit. It is a well-known fact to all of us, traders, that market watch is an essential, yet an extremely tiring process and thus these limited options are nowhere close to ideal. On the other hand, Midas Platform supports many order types of orders, therefore gives their users a great deal of advantages. No more is the trader limited to the inadequate range of orders provided by the exchanges: Stop-loss Order, Trailing Stop-loss Order, Conditional Trailing Stop-loss Order, Multiple Standby Order and other common order types. Additionally, the Midas ecosystem has its own CEX integrated into it, created exclusively for the Midasians use. In case of being interested in investing into ICO; we have created the Midas Foundation: a Decentralised Autonomous Organization ran on a web-based platform. 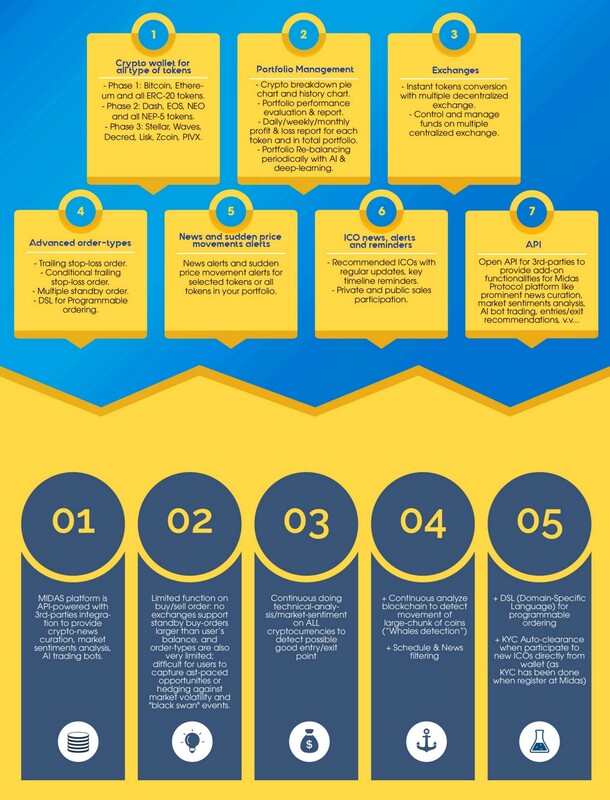 With the aim of kickstarting potential frontier technology projects, providing reliable information and validating projects according to the Global ICO Transparency Alliance Framework, the Midas Foundation acts as a safe haven to all its participants, dedicated to bringing the most benefits, rewards and investment protection to everyone involved. The Midas Foundation thoroughly filters all of the projects before it engages to help them in any way to ensure fellow Midasians will indeed be able to turn into gold whatever investment they lay their hands on. And! Should you choose to invest into a particular project using MAS, you will be rewarded by a special bonus unique to the project. Midas Foundation also offers an additional way of investing: users can get together and create a shared crypto fund by their token contributions, thus producing Masternodes and generating extra passive income. So yes, at the end of this process you end up with a profit proportional to your investing efforts. It is usually a no brainer that being successful within the crypto space, you will want to invest further. Nevertheless, continuing in crypto investing is not your only option. On the contrary, thanks to the integration of MASpay, you can comfortably spend your cryptocurrencies directly from your Midas wallet on any E-commerce platform which accepts crypto payments. You can also opt for conversions as crypto-fiat, crypto-crypto and so forth. The point is, the choices are abundant and they are yours to make entirely. These several described features of the Midas ecosystem have perhaps shone a better light at the whole Midas project and ignited the land of opportunities to those more interested. One cannot however hope, that mere words are enough to completely describe The Midas ecosystem in its entirety, it is only the users’ experience that is able to and which we await with great anticipation. Nevertheless, we at Midas are proud of the efforts we have put in and through it created so far. We will continue to strive for creating a robust and trustworthy cryptocurrency space with the goal of becoming a “closed loop” network — a space where suppliers bring to the consumers all sorts highly demanded benefits services, where all the products and services provided work in sync to support each other and where excellent customer service is a top priority. Intelligent platform to manage, invest and spend cryptoassets. Anytime - Anywhere - Secured.